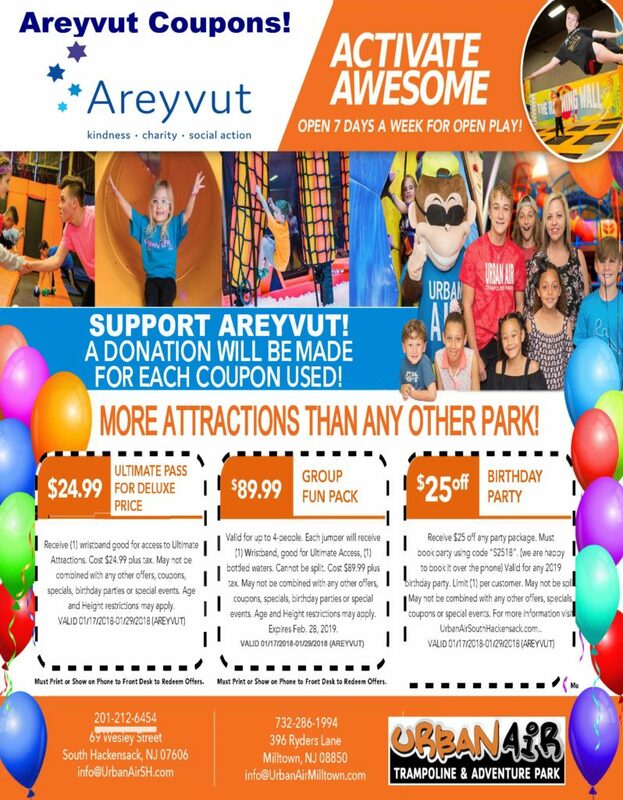 Areyvut is pleased to partner with Urban Air Trampoline and Adventure Park to offer a discount to friends of Areyvut over Yeshiva Break. In addition to the discount, Urban Air will be making a donation to Areyvut for every person that uses the coupon below. So please share this with family, friends and colleagues. This is a win, win, win. You receive a discount, Urban Air gets awesome customers and Areyvut is able to offer a discount to our friends and receive a donation from Urban Air. Help us and post this to your social media channels and in your WhatsApp groups. Urban Air Trampoline and Adventure Park is a large-scale indoor trampoline center hosting open jump, fitness classes, dodgeball and parties. There’s so much to do inside Urban Air that you might have to come back for a second visit. Once you’ve experienced the adventure park for yourself, you’ll see what we mean when we say they’re more than just a trampoline park. Young or old, tall or short, athlete or armchair quarterback – their attractions will help you defy gravity. Test your skills in the Warrior Obstacle Course, compete with friends, or practice your own tricks freestyle. No matter how you choose to play, you can take it to the next level at Urban Air. Their variety of attractions is another reason why Urban Air is the perfect place for an indoor kids birthday party, a Bar or Bat Mitzvah party or even a corporate team building event. Every kid likes something different and it’s almost impossible to please them all. But at Urban Air, there’s so much for the kids to explore, they’ll have a hard time deciding which attraction is their favorite. Please visit https://www.urbanairtrampolinepark.com/locations/new-jersey/south-hackensack for hours and a reminder to please share this coupon with others.